In our last blog we discussed some of the causes of sensitive teeth. In this post, we will discuss some suggestions to treat sensitivity. The treatment for sensitive teeth will depend on what the cause is. There may be specific dental treatment needed to treat the problem, or there may be treatment you can begin at home. To begin with, some advice on what you can do at home to try to help. 1) Keep your teeth clean. 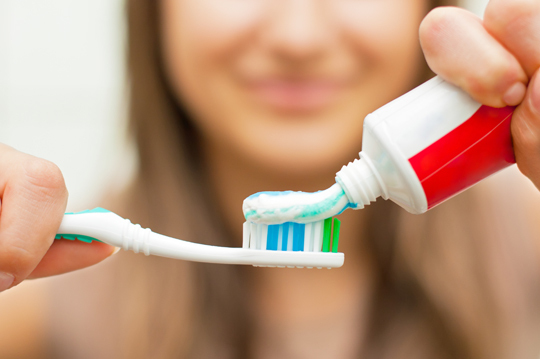 A proper oral hygiene routine is key to preventing sensitive teeth. Follow proper brushing and flossing techniques to thoroughly clean all parts of teeth and mouth, so you remove all the plaque and deposits without causing damage to the teeth or gums. 2) Use a soft bristled toothbrush, and change your brush every 3 months. If you are unsure how to brush without causing damage, ask us! 3) Use desensitizing toothpaste. There are several brands available. Avoid whitening or abrasive toothpastes. Keep in mind that these desensitizing toothpastes must be used on an ongoing basis. If you stop using them, the sensitivity is likely to return. 4) Watch your food consumption. 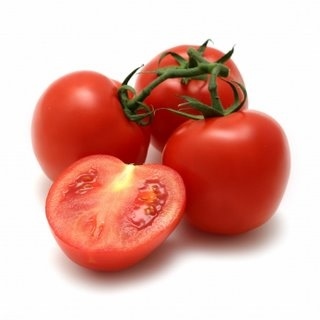 A regular diet of highly acidic food can gradually dissolve tooth enamel and lead to dentin exposure. Do not brush after consuming acidic food and beverages, wait to brush for 60 minutes to give your saliva time to neutralize the acids. Keep sugary and acidic foods to a minimum, and avoid snacking between meals. 5) Do not brush your teeth after vomiting. Because acid softens the tooth’s surface, brushing will cause more enamel loss. Wait 60 minutes until the natural flow of saliva washes away the acids. You can rinse with water after vomiting. 6) Use fluoridated dental products. Daily use of a fluoridated mouth rinse can decrease sensitivity. Fluoride varnish treatments at the dental office can also help. 7) Protect your teeth from grinding and clenching. 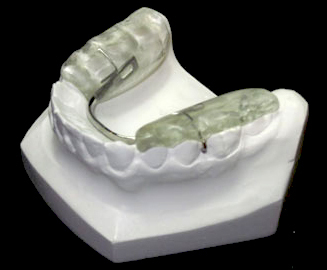 You cannot sub-consciously stop grinding your teeth at night, but you can protect them with the use of a custom-made night guard. 8) If you have broken, decayed, or cracked teeth, get them treated as soon as possible. 9) If your bite does not feel even, consult your dentist to have it checked. 10) If you experience sensitive teeth when whitening, you may need to slow down the whitening process, brush with a desensitizing toothpaste for 2 weeks or so before you begin whitening, treat you teeth with special desensitizing solutions while whitening, or use a different whitening solution. 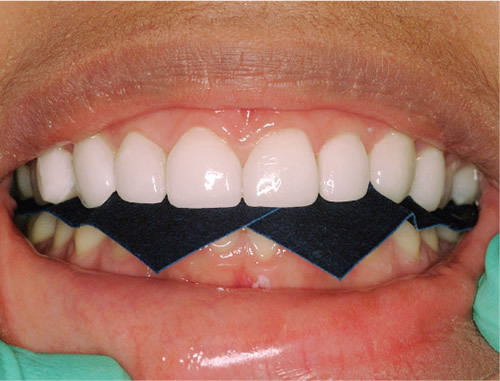 Fluoride varnish and gels can be applied to the teeth. If applied regularly these treatments will not only help to strengthen the teeth, but will make them less sensitive. 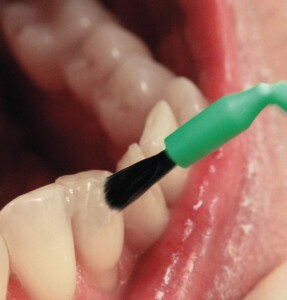 Special desensitizing coatings (like ‘Gluma‘) can be bonded to the teeth on the sensitive areas. These can help reduce symptoms by sealing over the dentin. Keep in mind that both the fluoride or desensitizing coating treatments may need to be repeated every few weeks as symptoms can take time to settle. If symptoms persist, a filling may need to be done to cover over the sensitive areas. In rare, extreme cases a root canal may be required if the tooth remains very sensitive. Remember, we are here to help. If you are having sensitivity issues, call us to book an appointment. We will do our best to discover the cause and work with you to relieve the symptoms. This entry was posted in It's Your Health, Oral Hygiene, Other Tips, Prevention and tagged sensitive teeth, treatment for sensitive teeth. Bookmark the permalink.